Esri Founder and CEO Jack Dangermond (center back) visits a breakout group at the Spatial Business Academy, including (from left) Joe Holubar of Travelers Insurance; Theresa Gebhart of U of R; Michael Yocius of Kohler Company; Thomas Horan of U of R; Cindy Elliott of Esri; Enrique Perez of OXXO Stores; and Paris Williams-Allen of Transwestern Insurance. 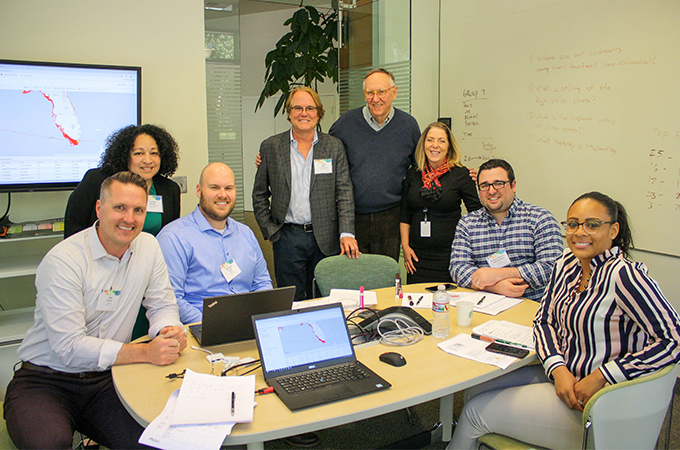 The University of Redlands and Esri jointly hosted the inaugural Spatial Business Academy last week, providing executives with training that blended business knowledge with location analytics. Companies represented at the three-day event, part of the larger Spatial Business Initiative, included Advanced Innovative Technologies, Fifth Third Bank, Kohler Co., Orscheln Farm & Home, OXXO (a large Mexican retailer), Republic Services, SoCal Edison, The Shopping Center Group, CSX Railroad and Travelers Insurance. With sessions at Esri headquarters and on the U of R campus, presentations covered spatial foundational principles, applications, and strategy. Erik Henderson, technical director of enterprise GIS at CSX Railroad, found the information reshaped his thinking about his job: “The academy has helped me understand that strategy is far more important than I thought it was. … I need to communicate my team’s strategy to others in my company.” The importance of the Academy was underscored by Esri Founder and CEO Jack Dangermond’s visits to each of the breakout groups at Esri-located sessions, where he discussed the value of spatial business concepts and applications with participants. Reflecting on the event, Horan notes: “I think we (U of R and Esri) are tapping into an important need to provide GIS managers and leaders with a hybrid business-GIS skill set, and I expect we will be doing even more in this training arena given the very positive reception we have received to the Academy."